Welcome to the dynamic world of Self Defense and personal development. We are a select group of schools located around Peterborough, Ontario, Canada and we are dedicated to Martial Arts Training, having fun with like minded people and learning the ancient Japanese Art and Science of Chokushin Aiki Jujutsu. We are one of many martial arts schools in the Peterborough area offering high quality, safe instruction for teens and adults. 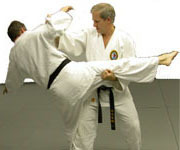 Through the practice of Chokushin Aiki Jujutsu we strive to develop our body, mind and spirit. We believe that by drawing on focused intention, meditation, physical training and time, we all have the opportunity to meet our highest potential.